The Community Guide will be beautifully printed in full color glossy 8.5×11″ with UV coated cover. Not only is the Chamber Directory / Englewood Community Guide available in printed form, but it’s also accessed from the Chamber’s homepage (Open current edition of Community Guide). We make it easy for you to reserve your space. Simply use the form below to: (1) Select your desired size ad space. (2) Pay for your ad … and (3) Email your ad / art file to CommunityGuide@EnglewoodChamber.com. 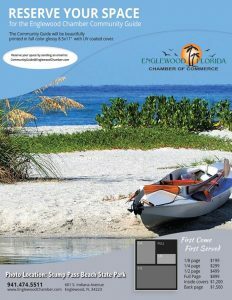 Alternatively, you can contact us at 941.474.5511 or CommunityGuide@EnglewoodChamber.com to reserve your space.